Exhaustion is setting in for me. Last night, once I crawled in to my tiny hospital couch bed, I found I couldn't keep my eyes open enough to write about our day. So, I gave up and just went to sleep. Even now, after a few hours of rest, it feels challenging to write. But I want to make sure I write about our day yesterday since it was a very important one. To start off, we have made no progress in sharing with Bennett about his ostomy. Bennett has been in no condition to talk to about his colostomy so that continues to be something we are putting off for another day. Before we can leave, the hospital staff must have the confidence that we can care for his ostomy. So, there will be some kind of attention given to it in some capacity. But I am not sure when. As far as going home goes, we haven't yet begun talking about that. The steps that would be necessary to go home include: Bennett's bladder foley being removed, Bennett's physical activity being increased, Bennett's pain being managed, Bennett's lung hygiene regimen being returned and Bennett's ostomy care being addressed. On Friday evening (night before last) when we were trying to get him moving, we noticed Bennett's stomach seemed quite distended. Noticing this and his being so uncomfortable, I suggested to the nurse that we begin venting his g-tube, a trick I learned from our last surgery a year ago. The nurse and I were both surprised about how much air we found in his tummy. I also noticed that when venting his tummy, he had really black discharge. The residents explained the black wasn't particularly concerning as it was just dried blood in his stomach from the bowel surgery. Bennett's Friday night seemed fairly restful. He had a good bit of pain meds on board that kept him comfortable. But what we noticed on Saturday morning was that when he was awake, he wasn't really peaceful nor did he wants to play with his toys or watch movies. It seemed like the only way to get him comfortable was to give him meds that put him to sleep. But, considering his being awake and moving is important for his recovery, it was hard to see that his being awake meant he was uncomfortable. Even with the pain medicine Hycet on board, he was very irritable. 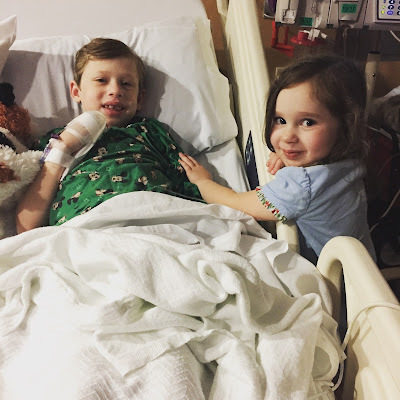 I began to have flash backs to his surgery last year where we kept giving him pain meds but it felt like no amount was enough - even to the point that Bennett developed a reaction to the build up of Morphine in his system. I wondered: why does Bennett have such a difficult time with pain after surgery? Bennett's clinical team has been very responsive to his care while we were here. Yesterday, we continued to notice Bennett's urine output from his foley was very dark which indicates dried blood. This is not particularly unexpected since Bennett's surgery apparently required the Surgeon to cut away his bladder that was surprisingly adhered to his bowel due to scar tissue around the stricture. But, everyone was hoping he would soon start outputting pee that wasn't so dark. Lightening of his urine would indicate internal healing. 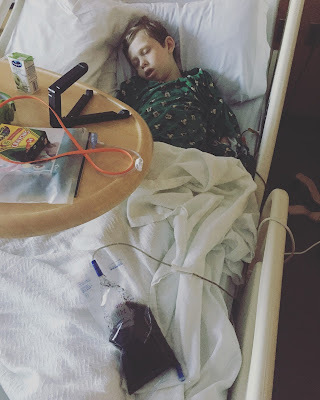 In addition to his not being able to get comfortable and his dark urine, I mentioned to his doctors about the continued strange dark black output from his g-tube when we vented him. And everyone could appreciate the amount of gas coming out of his belly. Mid morning, Bennett began looking very pale. And we noticed Bennett wasn't putting any output from his colostomy, despite we had started feeding him through the g-tube the day before. His nausea which we were treating with regular doses of Zofran didn't seem to even lighten up at all. 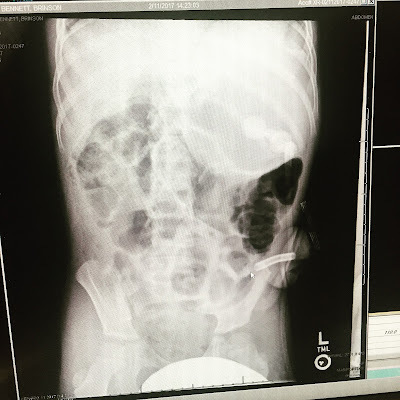 The doctors collectively decided to run some blood work and do a KUB (X-ray of his tummy) to see if they could find out what was going on in his belly - and to make sure he wasn't bleeding internally. At one point, Bennett wasn't waking up from his sleep like I felt he should be able to do. So, I caught our doctor in the hallway and asked her to come see him. We were able to get him awake a bit more but he gave me a scare. Our doctor, who is always willing to listen to my concerns, called in the Surgeon on call and everyone met together to discuss what might be going on. See all that gas (black indicates air) in Bennett's tummy? That's evidence of an ileus. Can you see Bennett's ostomy sticking out from his skin on the left side of his body? Thankfully, Bennett's blood work came back fine. But it was the X-ray that showed us what is going on: Bennett has an ileus. An "ileus" is what you call a lack of movement in the intestines that can lead to a buildup or blockage. In this case, gas has gotten trapped in his bowels and because of the ileus, the gas can't move out. An ileus in itself is not necessarily a serious condition (or a surprising condition considering Bennett had major abdominal surgery) but if not treated and identified, it can be a risk for a bowel obstruction. Bowel surgery "traumatizes" the bowels. They are handled, massaged, cut, etc. So, it's no wonder that they need a bit of time to work properly again. They are often described as "going to sleep" after surgery as they need a bit a rest before performing as they should. The issue with Bennett's bowels is that they seem to move or wake up even more slowly than others bowels. When this happens, when they become almost paralyzed, it's referred to as an ileus. Considering that this is what Bennett is dealing with, the decision was made to stop his tube feeds (if the bowels aren't working, adding food isn't a good idea) and to begin continuous venting of his gut through this g-tube. The hope is that by continuous venting, the air can come out. 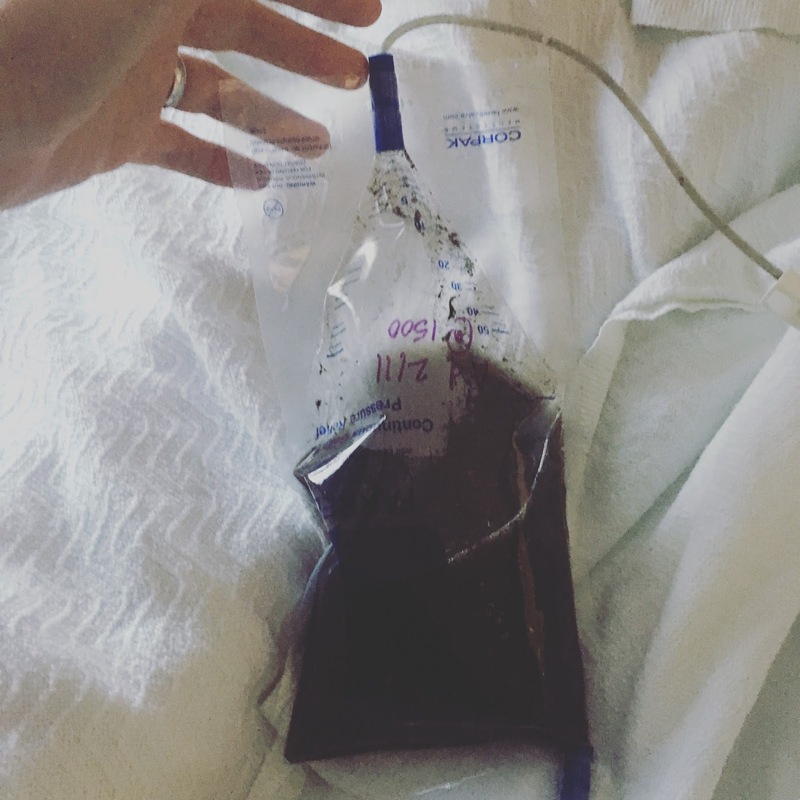 This bag represents 330ml of dark fluid that came from Bennett's belly within hours of venting his g-tube. THIS is what was causing Bennett to be SO uncomfortable this whole time. Because the bowels weren't moving, this fluid and gas was getting trapped inside, causing a LOT of pain. Because Bennett is so young, he can't yet describe his pain very well, pain was trying to be controlled through pain medicine. But pain medicine is what often slows the bowel even more. Fear that pain meds might actually be making it worse, doctors pulled the Hycet and Valium and gave him Tylenol through his IV instead. It's always scary to take away a pain med after surgery but recognizing treated the real issue of his pain, a bunch of pain med wouldn't be necessary. As far as the dark color of his pee goes, the doctor made the decision to increase his IV fluids in hope that this would flush out his system more. It seems to be working so far. Oliver and Avonlea spent the day at the hospital with us yesterday. They could tell Bennett wasn't feeing well and were there when I became a bit frightened by his lack of responsiveness. So, it was really wonderful when yesterday evening Bennett woke up feeling tremendously better. Avonlea was the first to his bedside to rub his arm and say, "Hi Bennett!" Bennett responded to her with a smile and silly faces. That's when I knew we had turned a corner. Before Oliver and Avonlea left the hospital for the night, I sat with Oliver in a sitting area outside Bennett's hospital room and decompressed with him about his day. He expressed it was very hard to see Bennett in pain. At one point, I asked if we could pray for Bennett. He liked that idea. I pulled my growing long-legged 9-year old boy into my lap. He bowed his head and folded his hands like his little Episcopal school once had taught him to do. I said my prayer first and then he said his. He asked for God to put an angel in every room in the hospital of someone who was hurting. He asked that God would help Bennett feel better. And then he asked that God would make it so that tonight Bennett wouldn't have "dark dreams" but instead would have "dreams full of superhereos." The thoughtfulness of his tender little prayer practically made my heart burst out of my chest. What better thing to ask from God, for a brother who is hurting, than dreams of superheroes? Bennett slept really really well last night and has continued to feel good this morning. The doctors have discussed inserting another tube in his ostomy to help him get out even more air from his belly. We will see what the day brings but I expect today to be a much better one. can words convey tears, and a silent hug?